Youthfront, a 72-year-old Kansas City youth ministry, is passionate about recovering classic Christian formation in the lives of young people. At Youthfront LaCygne, they’ve created a theological playground, a space for young people to think, reflect, doubt and pray. Teenage pilgrims gather for mid-day prayer in the meeting-room-turned-sanctuary at Youthfront LaCygne in LaCygne, Kansas. All photos courtesy of Youthfront. This article by Michelle Strausbaugh was first published in Faith & Leadership (www.faithandleadership.com) on August 11, 2015. They don’t play paintball anymore at the former Youthfront Camp South in La Cygne, Kansas. The high ropes course and the ATVs are gone as well from the 600-acre facility now known as Youthfront LaCygne, located about an hour south of Kansas City. Instead, the high school students who attend one of LaCygne’s six one-week summer sessions pray. They gather for morning prayer, midday prayer and evening prayer. They talk about theology. They work in the garden and wash dishes. They sit in silence. They learn about and practice Benedictine prayer and Taizé worship. They are not campers. They are pilgrims, participants in the everyday life of the small spiritual community that now lives year-round at Youthfront LaCygne. 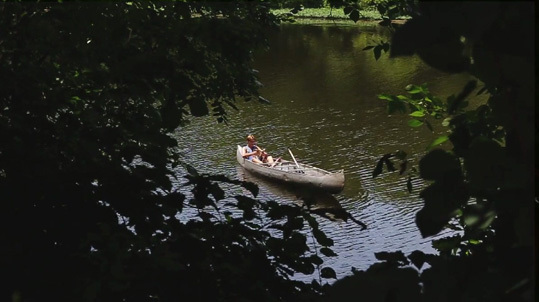 A canoe on a quiet pond is a good place to read and reflect for this Youthfront pilgrim. Launched two years ago, this new model is the most recent of many changes over the past 15 to 20 years at Youthfront, all part of a broader theological and organizational shift by the Kansas City-based youth ministry. Now into its eighth decade, the ministry is a remarkably nimble organization that has evolved and adapted over the years, said Kenda Creasy Dean, an authority on youth ministry. Youthfront traces its roots back to 1943, when it was founded by Al and Vidy Metsker as Kansas City Youth for Christ, part of a network of conservative evangelical, and in some instances even fundamentalist, Youth for Christ organizations across the country. From the 1950s through the 1970s, Kansas City Youth for Christ was known for its rallies and emotionally charged services. 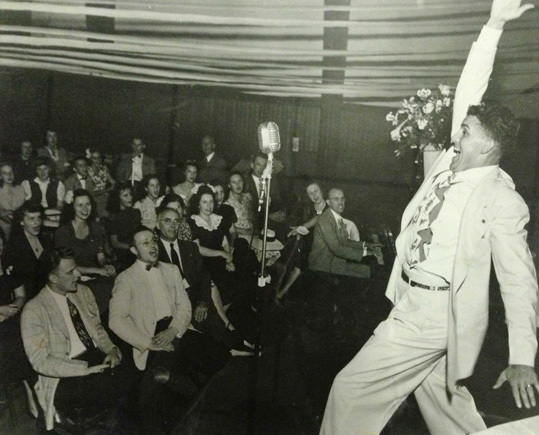 Cliff Barrows leads the singing at a May 1950 gathering of Kansas City Youth for Christ. On the front row, a young Billy Graham (left), who had been involved in the Kansas City group’s start as evangelist for the national Youth for Christ Association, sits beside KCYC founder Al Metsker. As King and others grew disenchanted with that approach, the organization began shifting to a more progressive form of evangelicalism. Later, in 1998-99, it changed as well from being a parachurch organization that was in effect competing with local churches to a church-assisting organization, one that saw its mission as helping congregations and providing training and support for their youth ministers. Today, Youthfront offers a variety of programs, including the spiritual community and retreat center at Youthfront LaCygne; a more traditional camp for elementary- and middle-schoolers; mission programs both in Kansas City and in Mexico; and youth worker training and mentoring. Permeating it all is an emphasis on Christianity and conversion, not as a one-time decision, but as a day-to-day commitment and a lifetime of discipleship. The organization’s stated mission is “to bring youth into a growing relationship with Jesus Christ.” And to Youthfront, historic Christian practices are at the heart of that relationship. “We are passionate about recovering classic Christian formation in the lives of young people,” King said. Fixed-hour prayer, “respiratory prayer,” Ignatian prayer and other traditions and practices are the church’s “family heirlooms,” King said. Directly through their camps and other programs and indirectly through the youth workers that they train, Youthfront introduces young people to these ancient traditions. It’s just like in sports, King said. You start with the basics, and through repetition and practice, you gain skills and eventually achieve excellence. “These are the habits you need to perform over and over if you’re going to excel,” he said. This emphasis on classic formation has been a part of Youthfront for about 10 years. 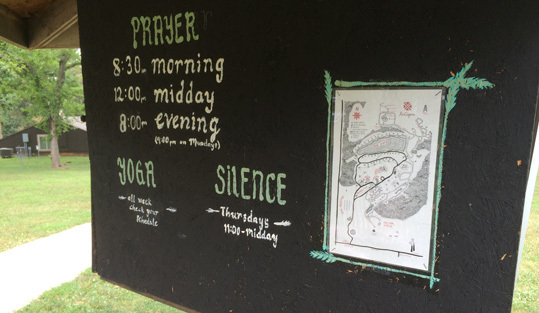 Even at the camp for younger children, the campers come together for morning, midday and evening prayer and compline, and engage in other traditional Christian practices. Fixed-hour prayer is fixture of daily life all year long at Youthfront LaCygne. In many ways, the transition from a more traditional church camp to Youthfront LaCygne is a “doubling down” on Youthfront’s commitment to classic Christian formation. For years, Youthfront had thought about establishing a year-round neo-monastic community at LaCygne and drawing upon that to create a different kind of formation program for teenagers, said Micah Thomas, the director of Youthfront LaCygne. Inspired by the spiritual community at Taizé, France, Youthfront wanted to create its own year-round community at LaCygne, where teens and others could come during the summer and simply participate in the life that was already taking place, King said. As at Taizé, it would be a “situated learning environment,” where pilgrims come and experience the community and learn in context rather than being fed a fixed curriculum, King said. So in March 2013, a small group of people, including individuals and families, began living at LaCygne, working, eating and praying together. Today, about 20 people, including Youthfront staff and others, live there. In the summer of 2013, the new program, Youthfront LaCygne, was launched. 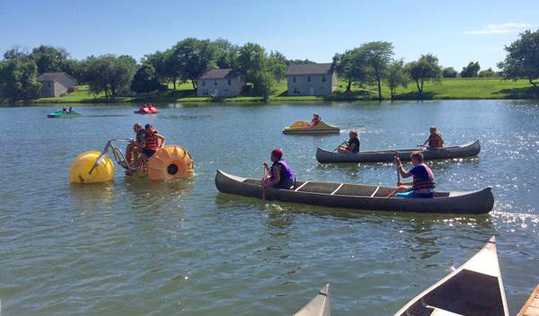 Though the ATVs, ropes course and paintball are gone, the high-schoolers can still canoe, hike, swim and take part in dozens of other activities. They are also expected to help out with the community’s daily tasks, washing dishes, for example, or working in the garden. Elementary and middle-schoolers paddle around the lake at Youthfront Camp West. But most of their day is spent in prayer and theological reflection. Morning, midday and evening prayers are the only required activities; otherwise, the pilgrims are free to choose how they spend their time. The community observes a daily hour of silence and serves Eucharist on Fridays. Even though Youthfront reduced the fee from the previous $315 to $220 to reflect the program’s actual cost, the number of kids enrolled dropped from 402 in 2013 to 213 last year. It held steady this past summer at 214. Another 2,000 people last year came to LaCygne in spring or fall for various retreats, most of whom also took part in some aspect of the year-round community’s life. The feedback now is mostly good, Thomas said. Zechariah Heintzelman, a member of Redemption Church in Olathe, Kansas, liked the new format so much that he came back for a second year this summer. Last year he was a pilgrim, but this year he was one of the “summer residents,” cooking for the community and working with the other high-schoolers. Joining the rhythm and practices of the year-round residents put “realisticness” into the experience, he said. 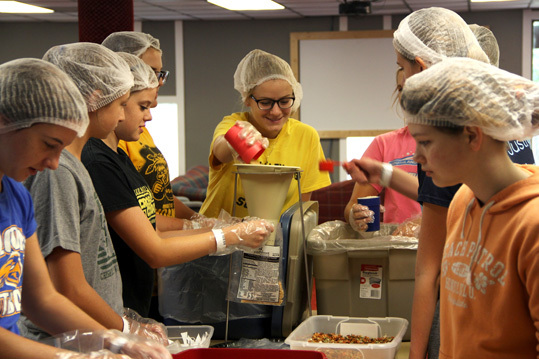 Teenagers at Youthfront LaCygne pack food for Youthfront’s “Something to Eat” crisis-response, meal-packing program. Phylis Ritscher, the director of youth and outreach ministries at St. James Presbyterian Church in Littleton, Colorado, was so interested in the new format at Youthfront LaCygne that she drove five girls from her youth group 10 hours to be there. She had been impressed by Youthfront staff she’d met in recent years and was intrigued by the possibilities her church’s teenagers might experience through a more contemplative approach to their faith, Ritscher said, especially by incorporating a prayer ritual. Three of the five girls said they wished the silent times built into the week and the daily prayers were longer, Ritscher said. Thomas said that everyone, staff included, has had to “grow into” the new mode of operating. “But because we have survived these three summers and it hasn’t folded in on itself like some parents said it would, now we have the luxury of saying, ‘This is who we are, and this is what we do,’” he said. Dean, the youth ministry scholar at Princeton Theological Seminary, said Youthfront’s willingness to take risks and experiment is rare. Most similar organizations tend to have a lot of turnover, Dean said, but Youthfront has administrative stability, which helps in setting a long-term vision. They also have the financial stability that allows them to take more risks, she said. If it works out, they can go with it, and if it doesn’t, they’re not going under because of it. “I admire their ability to experiment and try things outside the realm of camping ministries,” Dean said. Experimentation is “part of the DNA” at Youthfront, Dean said. “They just keep trying stuff until they find what they want,” she said. Dean also noted that Youthfront has been able to span the practical and the academic, constantly bringing theological reflection to how they do youth ministry. Youthfront regularly connects with theological thinkers who study and write about youth ministry, inviting them to teach theology to their staff and area youth pastors. And they are adept at taking the latest theological research and reflection and applying that knowledge to their work at Youthfront. “They’re on the forefront of translating youth ministry research into action,” Dean said. Youthfront has much to teach all church leaders, she said, especially the lesson that youth ministry is more than youth group. “You can do youth ministry in a way that goes beyond ‘rah-rah in the church basement,’” she said. She called Youthfront an example of a discipleship model, a way to lead beyond camp conversion experiences. Not that a born-again moment is not valid or life-changing, she added. “Asking Jesus to come into your heart is a daily discipline,” Dean said. That’s where the spiritual practices come in, she said. Practices such as praying, participating in the Eucharist and serving the poor help to shape people where they live. “If your faith is going to impact your entire life, you’ve got to learn some practices that knit you into the broader community of faith,” she said. Measuring the success and the effectiveness of youth ministry, whether at Youthfront or anywhere else, is elusive, Youthfront CEO King said. Numbers are one gauge, he said. How many youth pastors are engaged? How many kids are brought to something? How many professions of faith were made? But the bigger, more important metrics are more theological and subjective. It’s about “unleashing the imagination of every single kid,” he said. How has your vision of ministry and of leadership changed over the years? Where do you see those changes reflected in your organization or church? How do you sustain and nurture your faith day to day? What practices do you engage in? What new ones would you like to adopt? To what extent is your church or organization a “situated learning environment?” How can it be more like a community where pilgrims learn in context? Is your church a place of restoration where people are fully incorporated into community? Does an organization’s longevity make it more or less likely to take risks? How so? What practices or policies does your organization have that ensure it will remain nimble over time? What is your church’s vision for youth ministry? Is it broader than “youth group?” If not, what would a broader vision of youth ministry look like? Is your church’s youth ministry more like a camp, offering entertainment, or a pilgrimage, people on a journey together? In your own faith life, are you a camper or a pilgrim? Lilly Youth Theology Network is a collaborative effort of Lilly Endowment initiated and inspired Theology Programs for High School Youth located at seminaries, schools of theology, universities, and other church serving organizations across North America. Its mission is to advance the engagement of high school youth and their adult leaders in theological thinking about contemporary issues and vocational discernment. This network seeks to support youth theology programs in recruiting a cadre of theologically minded youth and adults to become committed Christian leaders in church and society.